Reintroducing an old friend for 2019, the Electra Glide® Standard. Powered by the muscular Milwaukee-Eight® 107 engine, the new Electra Glide Standard is a salute to the authentic Harley-Davidson touring experience. Inspired by the unrivalled heritage of the Electra Glide name, it provides a raw fundamental touring experience inspired by Harley-Davidson's Grand American Touring roots. The Electra Glide® Standard model is a “less-dressed dresser” that offers the purist the ability to disconnect from screens and gadgets and enjoy the ride. All of the Harley-Davidson Touring essentials are in place: The stirring performance of the Milwaukee-Eight 107 engine, the style and wind protection of the iconic Batwing fairing, convenient hard-shell saddlebags, the capable touring chassis, and, the peace of mind of a factory-fresh bike covered by a warranty. Designed for the traditional touring customer, the Electra Glide Standard is for the rider seeking to disconnect from all the noise of the day-to-day through riding. A simplistic approach delivers a motorcycle that provides and heightens the experience of the journey. This elemental experience is a key element in the design and engineering of the Electra Glide Standard. The Electra Glide Standard features essential Harley-Davidson styling elements such as the iconic batwing fairing, chrome trim, standard saddle bags, and cast aluminium wheels. Chrome accents are added in high-impact design areas and complimented by polished rocker, cam and derby covers and select blacked out components - a blend of traditional elements and modern trends. "To express the stripped-back essence of the Electra Glide Standard, we focused on finishes that were simple, timeless, and fundamental to the Harley-Davidson's touring line. Chrome was added to key components and complimented by polished and blacked out parts, for example," said Harley-Davidson's Vice President of Styling and Design, Brad Richards. Brad Richards continues, "The rocker, cam, and derby covers are finished with chrome to emphasize the V-Twin shape of the Milwaukee-Eight 107 engine. In addition, they add a dose of nostalgia that draws a through-line all the way back to the first Electra Glide." To provide a raw touring motorcycle experience without riding compromises, the Electra Glide Standard features all the latest ride and handling technology of Harley-Davidson's Touring line such as standard electronic cruise control, hand-adjustable emulsion-technology rear shock absorbers, 49mm front forks with dual bending valve suspension, and Reflex Linked Brembo Brakes with optional ABS. The deletion of the infotainment system enhances the light touch and leaves the rider to focus on connecting with the road. 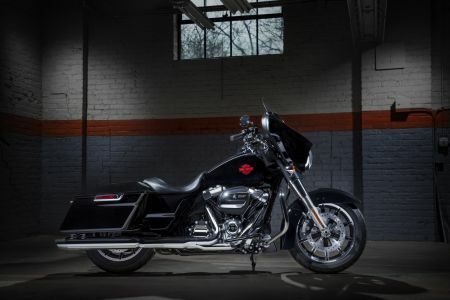 A central part of the touring experience, and a highlight of the Electra Glide Standard is its Milwaukee-Eight 107 cubic inch powerplant engine that features sleek, modern styling that respects the heritage of previous Harley-Davidson big twin engines. In the Electra Glide Standard, the Milwaukee-Eight provides the performance and riding benefits that consumers the world over expect and appreciate, including quick throttle response, plenty of passing power, and that iconic Harley-Davidson big twin sound. The Electra Glide Standard model is offered in Vivid Black with a ride away price of $34,495 AUD. *Prices listed are the Ride Away Prices for base models. Options such as colour are available at additional cost.